When you are searching for the perfect choice of engagement rings, the wedding ring may not be the closest thing on your mind. As the saying goes, that may seem like setting the cart before the horse. But it can be extremely valuable to consider both of these important rings when purchasing the initial one… not least because you will need to consider how the two will pair. 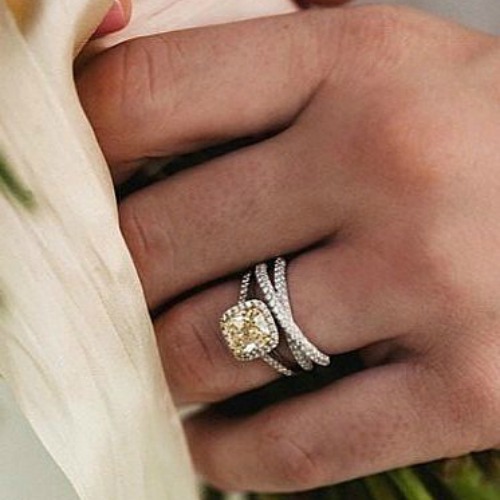 Many grooms (or brides, if the ring is chosen beforehand) are so focused on that boldly sparkling ring that the wedding band is often only considered as an after-thought. Pairing these rings will ensure that they can both be worn for the decades that lie ahead, without sacrificing style. With that in mind, it is important to see these rings as two parts of a final combined ring set. A classic, timeless combination that will never go out of style, this option pairs a delicate pave band wedding ring with a classic solitaire in a simple round cut. 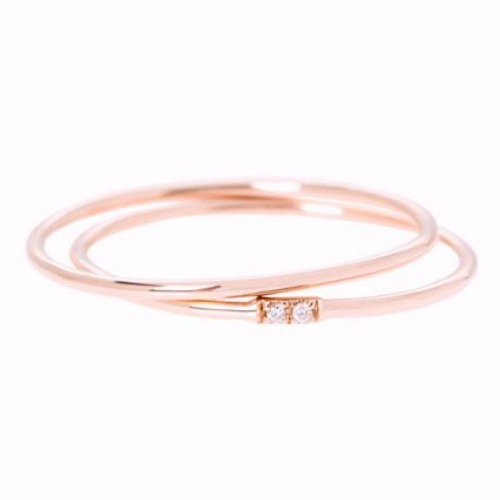 What makes this combination so perfect is the balance – both rings are dainty and classic, but the blend of pave and plain band gives it a flawless touch. 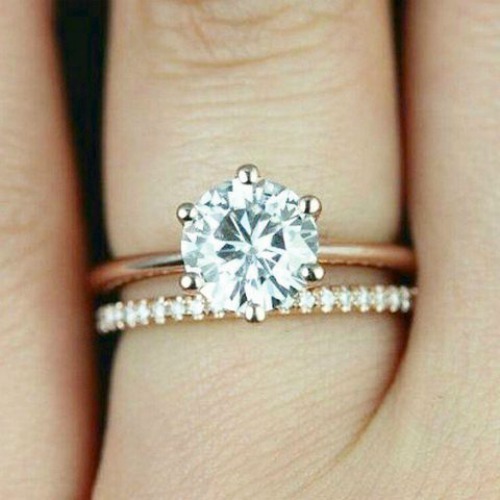 As the stones on the wedding band are so tiny, the solitaire is able to shine without being overpowered. And, as both bands are thin, the overall effect is not bulky or over the top. Another beautiful combination uses a twisted pave band and a solitaire setting for a more unusual take on the above pairing. Balance here is even more important. As the twisted band is larger and bulkier than a single, thin band, the other ring needs to be sized in a way that neither overpowers nor reduces the look of the twisted band. In this picture, the solitaire is set in a square shape on a delicate pave band, which off-sets the matching twisted pave band. The stone is also a coloured diamond, which further adds to the overall impact of the paired rings. For those who are not fond of too much bling, a minimal pairing offers a simple, chic way to wear both engagement and wedding ring. For best results, choose both rings in the same metal, with both bands in the same diameter. The wedding band can be left unadorned, while the engagement band can include a minimal, subtle setting with a stone or few. Rose gold looks particularly good in this pairing, but platinum, white or yellow gold are also timeless metals that suit the minimal look well. 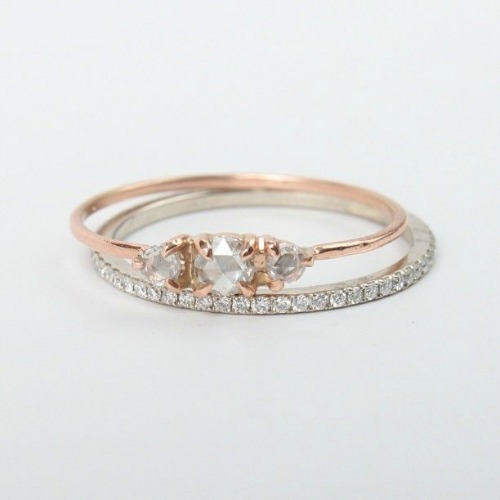 A set that is designed to fit together as two halves is another way to pair your rings. This combination can be as simple or elaborate as you wish. Ideally, the rings should be able to be worn alone or together, with the overall design changing when the two halves are merged. 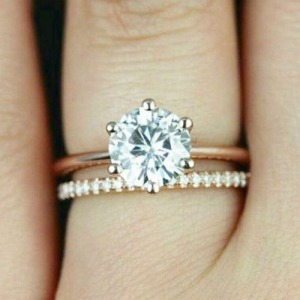 In the design shown here, a retro style diamond engagement ring is paired with a pave encrusted V shaped wedding band. Individually, both diamond rings look lovely, but together, they form a single ring in a perfect design. For best results, ensure that both rings are designed by an experienced, skilled jeweller. Using two (or more!) different metals is a good way to add visual interest to the sing set. Using a combination of your choice, you could choose to pair rose gold and platinum, or yellow gold and platinum, or even rose and yellow gold. For a more modern, edgy look, you could pair black gold with platinum or steel. Depending on the design of both rings, and the stones you choose for each ring, the overall effect can be classic and understated or bold and beautiful. Make sure that you keep the general rule of balance in mind however. If your wedding band is more ornate, keep the band of the other ring simpler. Likewise, if the engagement band is more ornate, opt for a plain metal wedding band instead of a pave band. As you can see, there are many different ways that you can pair your engagement ring with your wedding ring… with a bit of creativity and forethought, you can ensure that your rings are a perfect set!